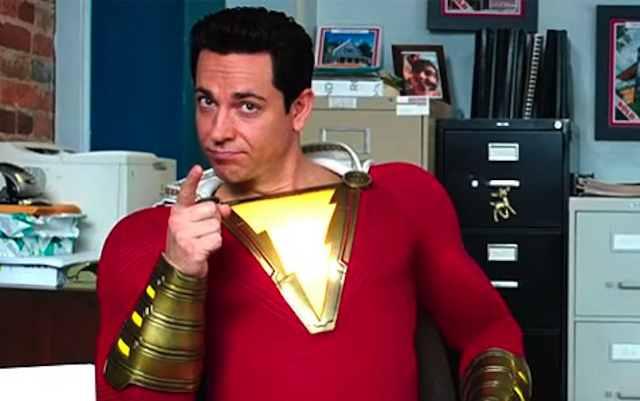 Everything about the circumstances are adventurous and at times amusing, but Zachary Levi isn’t that great at communicating the kid inside him, preferring jokes and panic. Essentially, like the film “Freaky Friday,” there is a child’s personality inside an adult body. If the film could have focused on this phenomenon, it might have been a better ride. It was content to make it more of a joke, which took away from the adventure, and in turn the adventure took away from the gags. 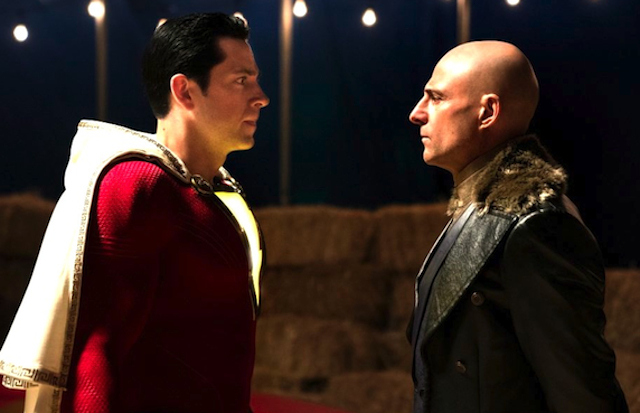 The story does balance the origin of Shazam (and there is a good running gag on what to call the new hero, making fun of the Captain Marvel kerfuffle) with his first case, a face off with the evil Dr. Sivana (Mark Strong). Sivana is trying to harness the evil side, represented by the seven deadly sins, from the wizard Shazam. The sins are personified as weird lizard-like creatures, which seems to be the common look for evil with the nerds in computer design. Mark Strong is a bit over the top as Sivana, and not very interesting, but he is a okay contrast for the gee-whiz of the new minted hero. Like its villain, the story itself doesn’t have much virtue or life. It kind of like paint by numbers, adding the right colors in the right places. However, the results are fuzzy – like a finished paint-by-number copy – and wasn’t satisfying for me. Granted, I didn’t know the new origin base with Billy and the foster family (it is the canon in the comics now), and that didn’t help, but the character of Shazam has always been a favorite of mind, because of the boy within the man, and the film doesn’t deliver the warm fuzzies comic book lore nor any nostalgia. Why does Marvel Comics now own the name “Captain Marvel”? Well, the wily Stan Lee saw that the name was available in 1967, and bought the rights to tweak DC Comics, forcing them to call their comic “Shazam!” when they revived the character in 1972. Who would have thought nearly 50 years later, the two characters from the one name would be competing in different multi-million dollar movies? Alice Through the Looking Glass has got nothing on the comic book/movie universe.